When you step into any room in your house, what do you see? Chances are, there’s something that immediately draws your attention. If it’s the window, then you really want to be sure you enhance its qualities as much as possible. Window treatments can add just the right color, style, texture, or pop to a room, so it’s important to choose just the right one. At Windo VanGo serving Baltimore, our trained consultants will be happy to help you sift through the options. Read on for some of the choices out there. 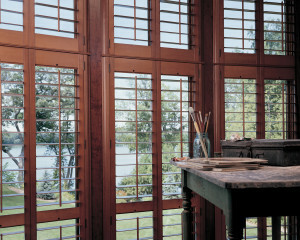 Although they’ve always been fairly popular, shutters can be quite costly if you want to have them in the entire house. If you want a similar look without the same price tag, try mixing and matching shutters and wood or faux wood blinds. In the Hunter Douglas shutter collection, there is an option that eliminates the tilt bar, so it coordinates with the look of a wood blind nicely. In this line, Hunter Douglas has given the traditional Roman Shade a totally new look. With consistent folds and no exposed rear cords, the Vignette Modern Roman Shades will keep the window uncluttered. They are available in different sizes, fold styles, textures, and colors and can be oriented horizontally or vertically. With these shades, regardless of interior color, the backing to the outside is white. If you’re looking for versatility in covering almost any type of window, Honeycomb shades might be for you. These shades offer the largest array of styles, colors, cell sizes, and opacities, as well as the greatest energy efficiency and sound absorption. Plus, they come at a variety of price points. Best of all, regardless of interior color, the back facing the outside is white, so you know you’ll have a consistent exterior look. 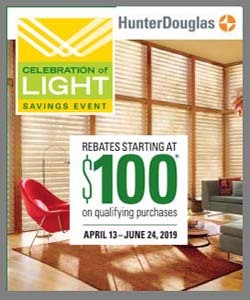 Windo VanGo is the premier Hunter Douglas Gallery in the Baltimore, MD, area, with a gallery showroom in Marriottsville and serving residential and commercial clients throughout the counties of Baltimore, Baltimore City, Howard, Carroll, Hartford, and Anne Arundel. Contact us today for a design consultation!